Wow, I really don’t mean to alarm anybody on this, first day of 2011, but I think we all need to step back and prepare ourselves for Judgment Day. Sign your crosses, drink the wine and chew the wafer. Because it’s officially time to repent. Sweet merciful crap, people. I just saw Jesus. It was awesome, and I have photographic evidence. 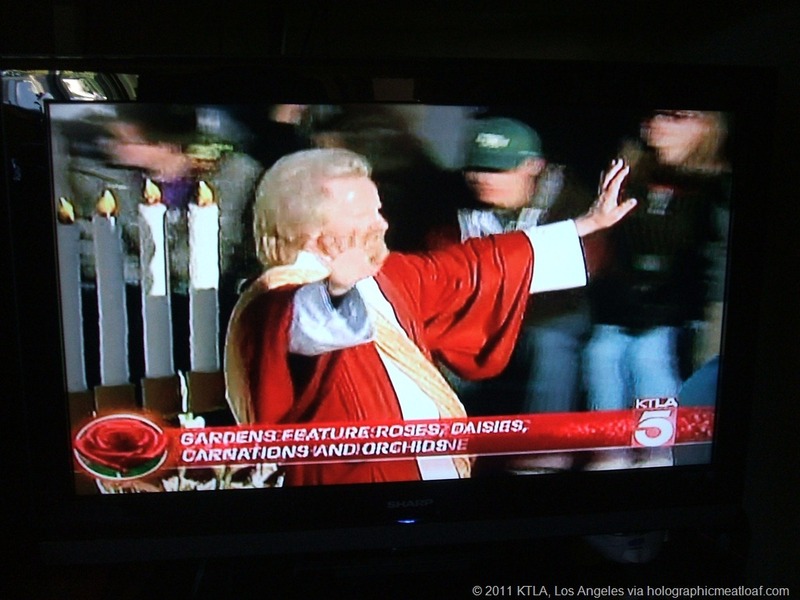 He was riding a Rose Parade float. The flowing robe, the grace…striking. Somebody better call the Pope. And just how do you go about booking Jesus for such an event, anyway? My birthday’s coming up in a few months and it might be a hoot to invite Him. This entry was posted in Humor, Photography, Strange Sightings and tagged 2011, end of the world, endtimes, jesus, judgment day, rapture, religion by Dave. Bookmark the permalink. 1) That is the whitest Jesus I’ve ever seen. I didn’t think it’d be possible for there to be a whiter Jesus than redheaded blue eyed Jesus, but that guy is it. He’s also pretty old to be Jesus, too. And a bit thick. I never fancied the Savior as a husky guy. 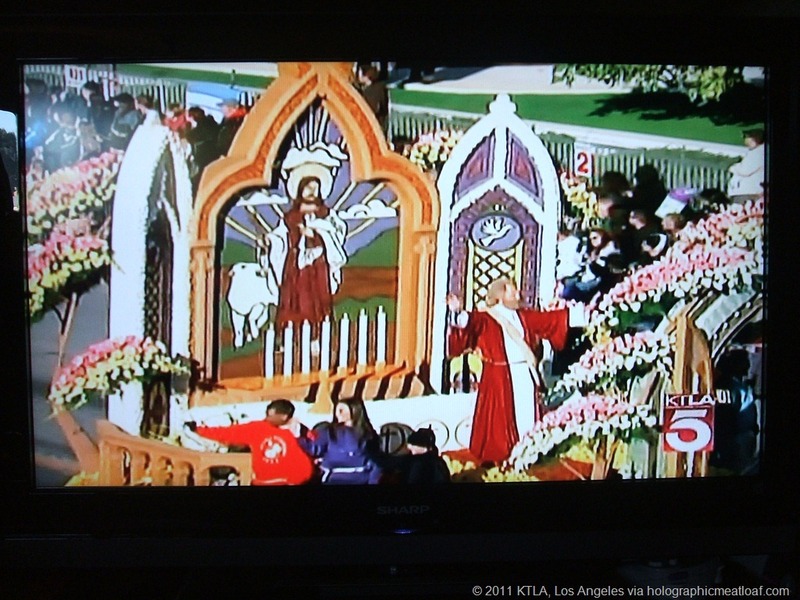 2) A burning bush float would have been much cooler. 3) Were those charming young people sitting on His float? How do you score that great gig? 1) His girth does leave a lot to be desired. A buff, Billy Blanks Jesus would be cool, though. About his age: He’s over 2,000! Give Him a break! 3) I think you have to have some serious connections for that–or just sell your soul to Millhouse. I wonder if He threw candy. Maybe those jordan almonds! That sounds biblical! I was thinking figs myself but I don’t think the crowd would have been to receptive of them. Unless they were Fig Newtons, then people wouldn’t have been too upset when they got nailed by Jesus. How would one explain that the next day at work?